Click here to be placed on a waiting list. 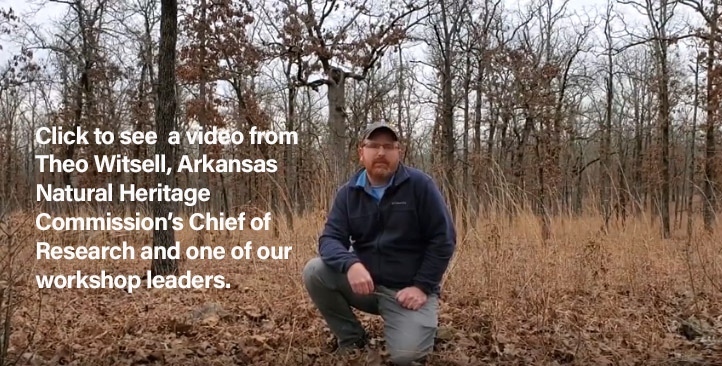 The Natural Areas Association, along with its long-time partners, the Arkansas Natural Heritage Commission and U.S. Forest Service invite you to join us in central Arkansas May 7th and 8th for this important workshop for natural areas professionals. This workshop is for practitioners who are managing similar systems in this region. Connect with land managers, ecologists, and other experts from around the region as we tour several managed natural areas and restoration sites and learn about the various components of the Arkansas Native Seed Program, a statewide, multi-organization partnership working to develop commercially available ecoregional-genotype seed resources. Participants will see how this program uses volunteers to collect seeds from remnant natural areas, partners with private industry to propagate plants, and works with local farmers who multiply seeds in propagation fields and sell them on the open market. Along the way we will discuss important considerations for pollinators in our management of natural areas. Field trip sites will include: 1) the Camp Robinson Special Use Area, a complex of high quality woodlands, savannas, and prairies with a 70+ year history of prescribed fire, 2) Barnhill Farms, a producer for the Native Seed Program, 3) remnant and restored prairies on natural areas in the Grand Prairie Ecoregion, 4) the Lake Maumelle Wildlife Management Area, and 5) sites in the Ouachita National Forest. We will also tour a farm producing seed as part of the Native Seed Program. Participants will meet and interact with experts from around the region and explore a number of interesting habitats in the Ouachita Mountains and Mississippi Alluvial Plain including tallgrass prairies, oak savannas, and oak and shortleaf pine-oak woodlands. We are fortunate to have the Arkansas Game and Fish Commission, Arkansas Audubon, Quail Forever, Central Arkansas Water, Roundstone Native Seed, and other partners share their expertise and experience on these important natural areas management issues. NAAs goal is to create an opportunity for practitioners to come together as a community, support each other and share tested methodologies and expertise as well as challenges - in a collaborative atmosphere. Fee includes a continental breakfast the first day and lunch both days. If you need overnight accommodations for the Regional Workshop, we have a room block at the Best Western in Conway where we have the special rate of $65.99 for single occupancy and $70.99 for double. Just call 501-329-9855 and ask for a room in the Natural Areas Association block to get the discounted rate.